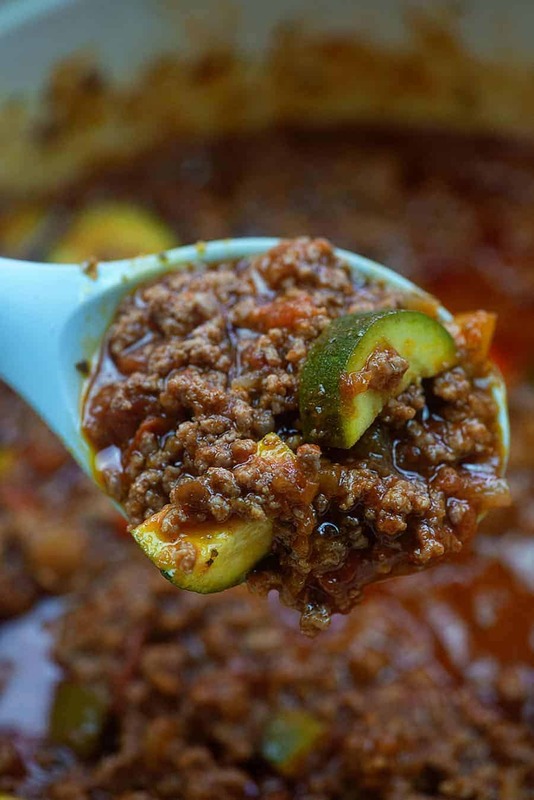 Goulash made low carb with the simple swap of zucchini chunks for macaroni noodles! This simple recipe is hearty, filling, and sure to be a family pleaser. My dad was telling me that the neighbor invited him over for dinner one night and served him a mixture of spaghetti sauce and chunks of zucchini. He couldn’t remember what they called it, but he was pretty obsessed with the dish. I immediately knew I was going to have to try that out and I’m so glad I did! I basically made an easy goulash recipe, but swapped in chunks of fresh zucchini for the macaroni. You guys. This is so good! 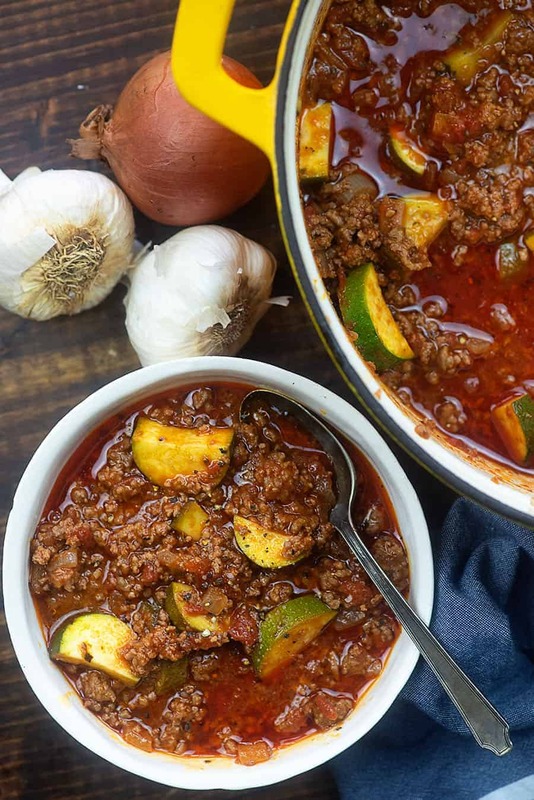 Goulash is definitely a pasta dish, so it seems a bit weird to low carb it, but y’all. This is a winner thanks to the chunks of zucchini! 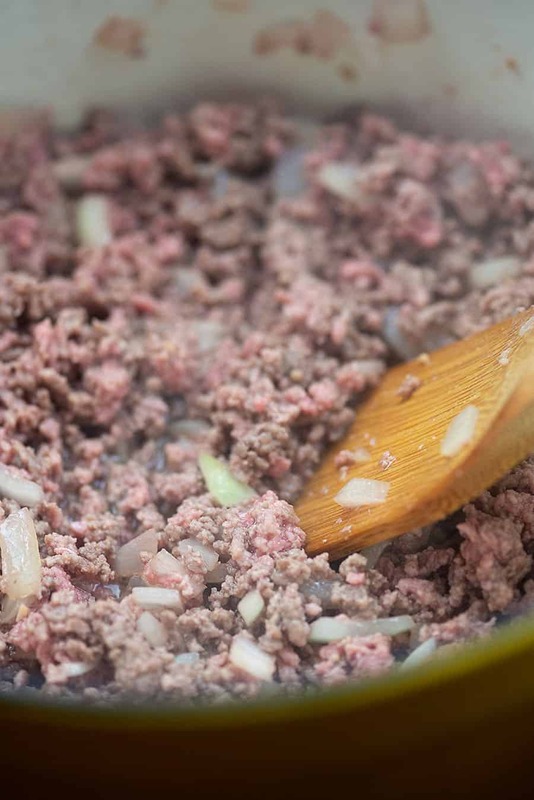 You’ll want to start with a pound of ground beef, an onion, and some garlic. Brown all those up together and then drain off the fat. Next, we’re going to use a jar of marinara. I prefer Rao’s brand because it both has the best flavor I’ve found in a jar and it’s the lowest in carbs I can find for a tomato sauce. It’s a little spendy, so if you have another brand you prefer feel free to use that. Dump the marinara in with the beef mixture along with some beef broth, soy sauce, Italian seasoning, seasoned salt, and a bay leaf. 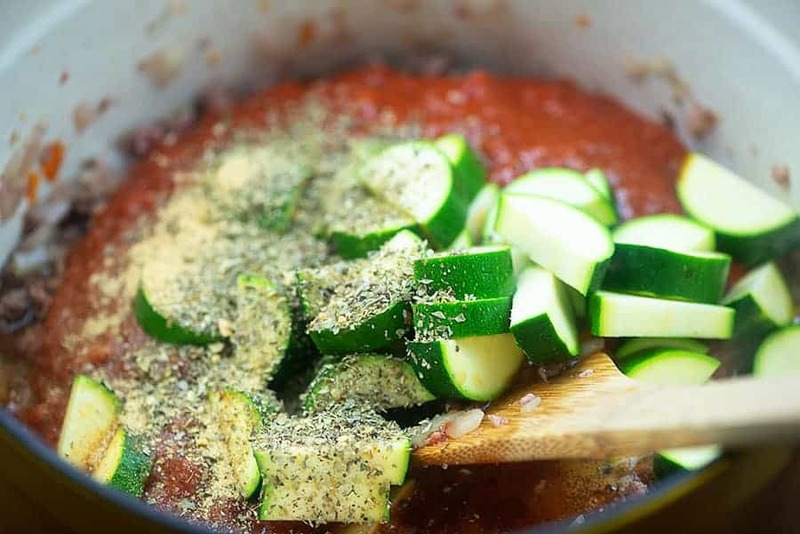 Add in your chopped zucchini, give it a stir, and let it cook until the zucchini is as tender as you’d like. 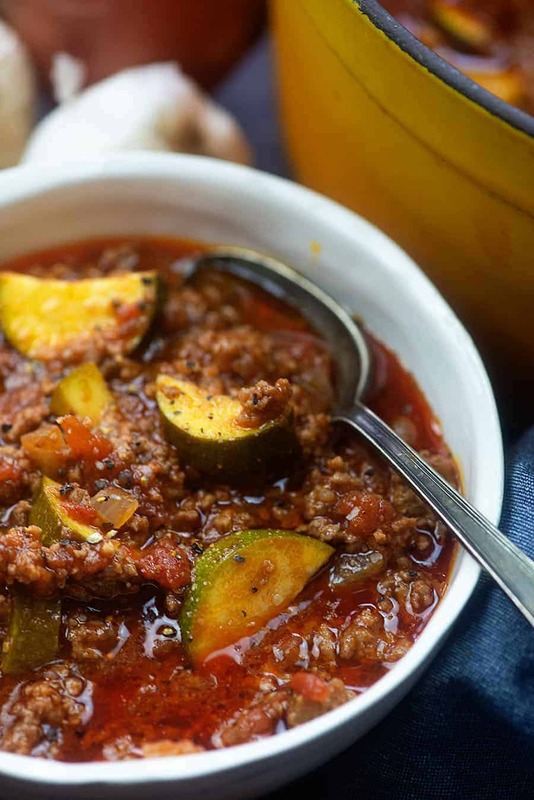 I cooked mine for about 20 minutes – just enough time for the zucchini to soak up a bit of the marinara flavors and get soft. Old fashioned goulash without all the carbs! Feel free to stir in some cheese, if that’s how you ate this growing up. We were never big on the cheese in this one, but you do you. Cabbage Rolls: Minus all the carbs AND minus all the work! This is an easy one! Brussels Sprouts with Bacon: Just about the only way I ever want to eat Brussels sprouts. ? Garlic Butter Shrimp: You can’t go wrong with garlic butter. Crock Pot Roast: I make mine with radishes and green beans! 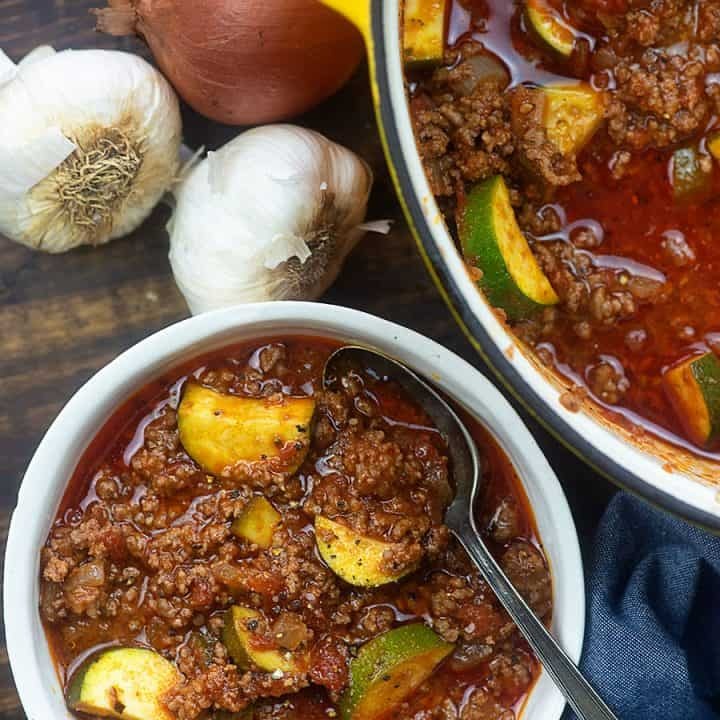 Goulash without all the carbs, thanks to an easy swap of zucchini for the traditional macaroni! Add the ground beef, onion, and garlic to a dutch oven and brown over medium heat, breaking the meat up as it cooks. When beef is cooked through, drain the fat and return the meat to the pan. Add the remaining ingredients to the pot and bring to a boil. Reduce to a simmer, cover, and cook for 20 minutes, stirring occasionally, or until the zucchini is as soft as you'd like. Add additional salt if desired and top with cheese, if desired. Feel free to use any brand of low sugar marinara that you prefer. Rao's is my preferred brand.